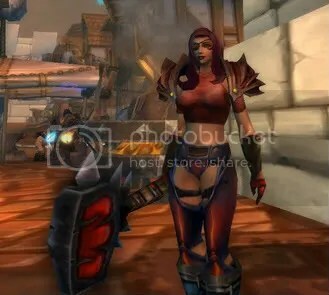 How To Accessorize in WOW…With Weapons! 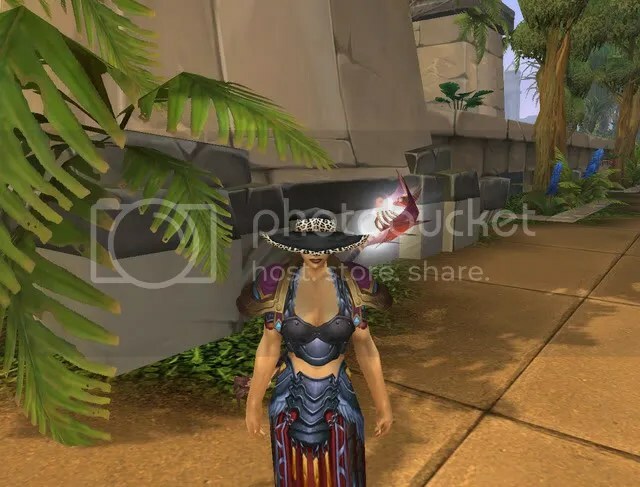 In addition to coming up with a cool RP/casual outfit for World of Warcraft, I often like to throw on some accessories in addition to the gear. These have often included weapons. Hey, no one ever said you can’t pair a pretty dress with a gargantuan sword or mace (etc.)! I bascially try to match weapons to outfits either by color or type of mood/attitude you want to present. You can make the outfit first then pick a weapon or vice versa, it’s up to you! Be aware that most cool looking weapons are from dungeons or raids, and you should ASK before you roll on something for purely RP reasons unless you are with friends who know you want it. I will say though, that there are some cool greens out there too if you use the model viewer while shopping the auction house. I love wielding swords on Chatmay, but I have also kept a few other pieces. 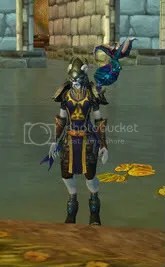 I find that the Lich King Naxx raid staff – Sulfur Stave – looks very lockish. It comes complete with flapping bat wings. 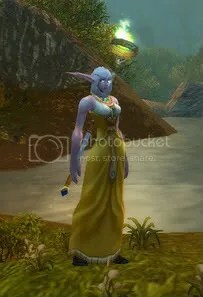 Here I paired it with Digested Silken Robes, also from Naxx, as well as Battered Jungle Hat. 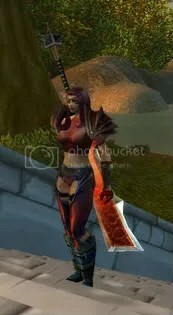 I also used this weapon at Halloween when Chatmay dressed up as Elvira. Meridia is a toon I rarely dress up or play around on…she’s all srs bzness. But when she does, I have two weapons from the original Zul Gurub classic raid. 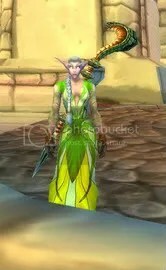 Pictured first is the Will of Arlokk staff paired with the pretty Hibernal Robe. Pictured second is the Zulian Scepter of Rites mace. They both look awesome, and nothing screams “mess with me and die” more than a snake accessory. While these weapons are no longer available, there are possibly other snake weapons in game as well as hopefully upcoming ones with the new patch return of ZG five man. For Meridia’s more meditative moments, I paired Elegant Robes… with Shadow Council Cowl of Intellect and Staff of Metanoia from Scholomance . This staff is a newer Cata piece that almost every caster had, but it is hilarious. The Metusoid Staff from the Vash area looks like a tentacle, and all four of them wiggle every so often. Very unusual, and I am looking forward to building either an aqua-heroine or diver type outfit around this piece one day. I picked these pants for the survivability...really! Check out the pants on this looker! Phillippa’s fave color is red, so most of these pieces have a red or red/black color. Simple Blouse of the Owl is paired with Warmaul Legplates of the Beast, Vice Grips of the Monkey which has been changed to just Vice Grips from ZF, the Hatebringer weapon, and some current 85 gear. Everything is plate except the leather eyepatch Eye of Rend from Blackrock Spire. I also tried pairing this outfit with Hellreaver from Hellfire Ramparts, but I really like it best with Hatebringer for whatever reason. 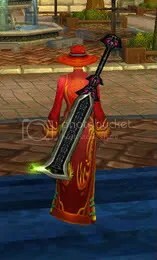 For an around town outfit, I paired the Festival Dress, which I have mentioned before as easy to get, with Crimson Felt Hat from lower level Stratholme and Sul’thraze the Lasher, which is still a created weapon from Zul Farak (and which is NOT easy to get lol). You can’t see it in this picture, but this weapon has black dots swirling around the end of it. I plan to write some more accessorizing how to’s in the future, but I hope you enjoyed this one!